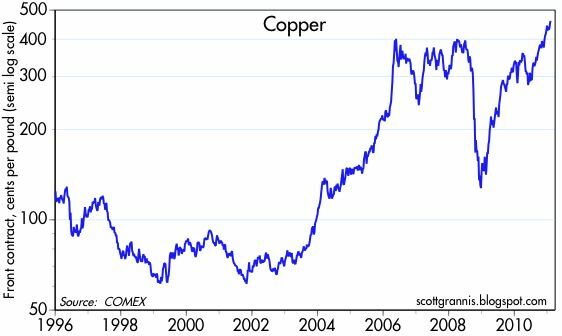 Copper is making a new all-time high today, and it looks like the rest of the commodity complex continues to move higher. I note that gold and the dollar haven't been going anywhere over the past 3 months, so that would lead me to believe that the rise in commodity prices is due to either a) a strengthening global economy and/or b) a lagged response to the monetary stimulus that has been applied in the form of QE2. In either event, this rules out deflation as a concern, and it stokes the fires of recovery, and that ends up being bullish for risky assets in general. Blogging will be light this week since I am skiing with friends at Keystone, Colorado. 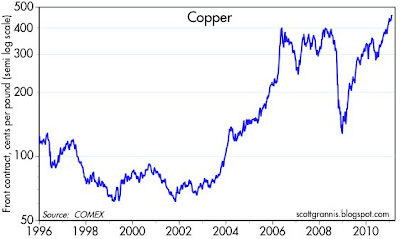 We still do not have any evidence (other than circumstantial) that QE2 is driving up commodity prices globally. My own hypothesis would be that global demand (e.g., from Asia) is pushing up commodity prices, but I need more information (which will likely be coming later this year) before I reach conclusions. However, accusing QE2 of driving up global commodity prices is premature. Also, rising commodity prices is also indictative of inflation (which the world could use more of right now). Inflation suggests that demand is up, and the lack of demand is what caused all of our economic problems to begin with. Finally, I continue to believe that the only viable way forward for the world, is via some form of inflation, whereby the public debt is deflated via the inflation mechanism itself. Additionally, inflation can rout government entitlements and public salaries with great ease, and without the need for a public mandate or negotiations with union leaders (pay and entitlement freezes will do the job that negotiators and legislators cannot). Inflation hurts lenders, which is fine with me, especially given the usury practices (e.g., 29% interest and outrageous bank fees) at leading banks these days. Everyone thinks that if the banks get hurt, the world will stop -- far from it -- when the "too big to fail" banks crash, other startup banks will step right in. PS: Regional banks are a bargain right now in the secondary market. PPS: If bond investors lose their money in bonds, so what -- the future of the world is at stake and the sacrafices of a few rich people and companies is a small price to pay for a more stable world. PPPS: I can hear everyone's comments now -- inflation leads to disaster -- I do not recall any disasters between 1973 and 1983 when the US experienced an 85% aggregate inflation. As Jude Wanniski and Robert Mundell have said, isn't it optimal to have stability instead of the constant instability of continual bouts between inflation/deflation? PS, William McKIbbin, '73 to '83 didn't look like a gangbusting bull market to me. In fact, wasn't there a back breaking bear market selloff right around 1975? That's all we need- a run on the big banks because we let them fail. Seems the Hoover administration tried that in '29 and we got FDR and the New Deal programs as a result. Your advice is geared towards those with assets, as well as investable income. How does getting lucky, attempting to trade around the margins solve the problems for the rest of society affected by the see saw between inflation/deflation? Which is something that Jude Wanniski spent a lifetime working towards. Stability for the rest of society so as not to have their lives confiscated by terrible fiscal policy?